Erica halicacaba is a unique species with no close relatives in the genus Erica. It is notable for its unusual growth form, its particular niche habitat amongst rocks and on cliffs, and the most unusual gooseberry-shaped flowers. It is a woody, gnarled, densely bushy shrub producing sturdy branches, with mature plants bearing many flowers. The branches are brittle, densely leafy and show prominent scars where the leaves have fallen off. The flowers are borne in groups of three or singly and are large, pale greenish-yellow. The flowers fade to become brown and crispy like the dried husk of a Cape gooseberry. Many specimens have a spreading growth habit or are procumbent, often growing pressed against rocks or cliffs forming mats up to 2 m² . The base of the trunk may grow to be rather thick (0.15 m in diameter) and an old plant can grow to look like a bonsai. It may reach a height of 2 m, however, the strong winds associated with its habitat usually keep the plants stunted or compact. No severe threats are recorded, but this species is listed as ‘Rare' due to its restricted habitat and distribution. Erica halicacaba is endemic to the Cape Peninsula (Western Cape) and is restricted to mountain tops, rocky ledges, and cliffs at middle or higher altitudes from Table Mountain to Paulsberg in the Cape of Good Hope Nature Reserve. 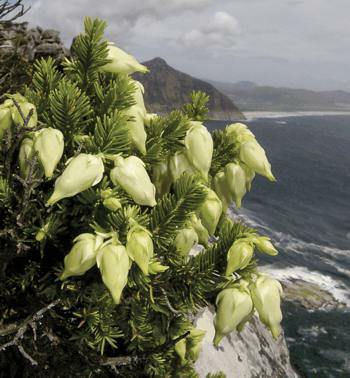 Many plants grow in inaccessible localities such as steep south-facing cliffs near Cape Point, or west-facing cliffs at Noordhoek and above Hout Bay. The plants are restricted to protected, rocky habitats not generally affected by fires. The specific name 'halicacaba' is derived from the (Greek) halicacabos which means gooseberry. The shape of the flower reminded Linnaeus of the Cape Gooseberry, Physalis. This species may be susceptible to too frequent fire as it is a single-stemmed, long-lived re-seeder. Its habitat specificity to rocky crevices means that most of the populations are protected from fire. It may reach a height of up to 2 m in protected, rocky niche habitats which serve as fire refugia. Most plants are however kept compact and pressed against the rocks by the persistent south-east winds. Flowers of Erica halicacaba are adapted for pollination by Orange-breasted Sunbirds who visit the flowers for nectar. 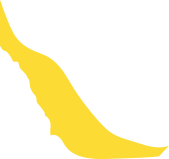 To reach nectar without robbing, a bird can only enter through the adpressed corolla lobes, tripping the anther ring in the process. The large amounts of pollen found on the culmen (upper ridge of the bird's beak) attest to high visitation rates resulting in good pollination and seed set. There are observations of flowers being robbed, i.e. a hole cut in the side of the corolla in order to access the nectar. 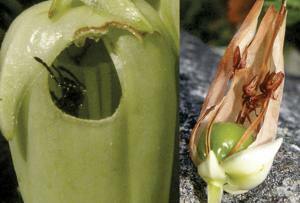 Myrmicaria nigra ants have been observed and recorded to be responsible for extensive damage to flowers and thus may have a negative effect on pollination, influence floral evolution and impact on plant population demographics. 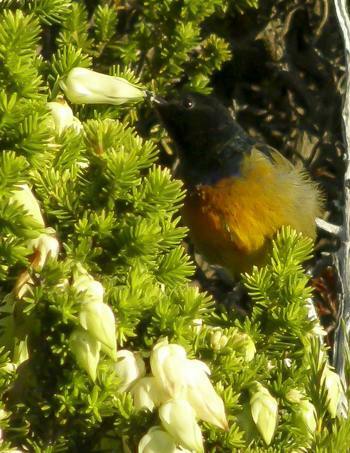 Very few bird-pollinated plant species are in flower in the study area on Glencairn ridge during October and November, and only two pollen types have been recorded on culmens of mist-netted birds. It can be deduced, therefore, that the nectar of Erica halicacaba and Saltera sarcocolla are an important energy source for resident Orange-breasted Sunbirds at that time. Erica halicacaba is an unusual and attractively shaped plant that is long lasting. It is recommended as a strong-growing, reliable garden plant and is easy to maintain in average Mediterranean conditions. It is particularly recommended as a long-lasting pot plant which should prove an ideal subject for bonsai. The bladder-heath is ideal for warm or cool, sunny or semi-shaded gardens and is salt-tolerant and therefore a good plant for a coastal garden. It is easily grown from fresh seed which should be sown in late summer or autumn. Germination is greatly enhanced by the application of smoke which mimics the conditions in nature. Seed is sown onto a well-drained, slightly acidic growing medium consisting of a combination of river sand and well decomposed pine bark in roughly equal proportions. Seed germinates in about six weeks, emerging as tiny, delicate plantlets that must be lightly watered with a watering can. Let the seedlings grow to about 10 mm tall before pricking them out into small individual pots. Young seedlings are encouraged to grow by feeding them every week with a diluted organic fertilizer. This species is slow growing and will only be big enough after 24 months when it may be planted into the garden. It is advisable to plant out during the cooler autumn or early winter months to allow the plants to establish before the onset of summer. This species is very woody and therefore much more difficult to root from cuttings than the finer-branched species. Cuttings should be selected from semi-shaded parts of the plant where the thinnest available shoots are found. This material is rooted in autumn or spring, in multi-trays on heated benches under mist spray. Select small tip or heel cuttings about 20-30 mm long, taking thin wood from the previous season's growth. Heel cuttings are preferred where a short side shoot is removed from the stem. The base of the cutting is treated with a rooting hormone for semi-hardwood cuttings which are then placed into a rooting medium of 50:50 fine-milled bark and polystyrene or perlite pellets. The bladder-heath grows near the sea in acidic well drained soils. It prefers rocky habitats and should, where possible, be planted amongst rocks, in rockeries or on embankments in the cooler parts of the garden. It will tolerate half day sun or dappled sunlight. Good watering once a week during summer months is recommended. It grows well in containers, providing that the correct, well-draining growing medium is provided. Fynbos planting medium is made up of a combination of equal parts composted pine bark or pine needles and river sand. A little (20%) loam may also be added. It is a woody species, so regular pruning is recommended to keep the plants well branched and compact. Plants that are pruned are more presentable, last longer and produce more flowers. Erica plants are adapted to living in poor soils, but, for best results, should be regularly fed with diluted organic liquid or small amounts of organic pellet fertilizers (5:1:5) that arelow in phosphorus. Goldblatt, P. & Manning, J.C. 2000. Cape plants. A conspectus of the Cape flora of South Africa. Strelitzia 9 . National Botanical Institute, Pretoria and Missouri Botanical Garden. Oliver, I. & Oliver, T. [E.G.H.]. 2000. 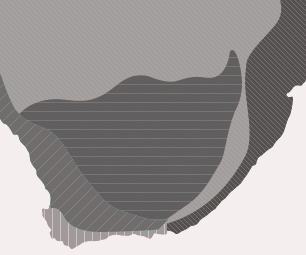 Field guide to the ericas of the Cape Peninsula. Protea Atlas Project, National Botanical Institute, Cape Town. Schumann, D. (Dolf), Kirsten, G. (Gerard) & Oliver, E.G.H. 1992. Ericas of South Africa . Fernwood Press, Vlaeberg, Cape Town. Smith, C.A. 1966. Common names of South African plants . Memoirs of the Botsanical Survey of South Africa No. 35. Turner, R.C. et al . 2011. Experimental evidence for bird pollination and corolla damage by ants in the short-tubed flowers of Erica halicacaba (Ericaceae) . South African Journal of Botany 79: 25-31.